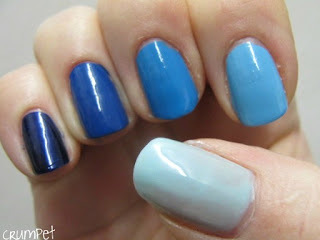 When I started the blog I planned to average at about a post a day, but in the last 6 weeks, that seems to have doubled! 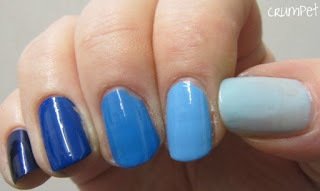 I think partly because my obsession has intensified, and also because I’ve started to have a LOT of ideas of how to play with polish. So whilst the first 200 posts have been mainly swatches, the next 200 are going to be quite different, with a mix of swatches, layering, basic art skills and whatever else tickles my fancy! I debated doing something AMAZING for my 200th post and my good friend Elizabeth Stern came up with a killer idea. Elizabeth – I’m going to save that for the 250th, cos I need to do it justice. Then Post 200 was going to be a polish that has just crashed into the Crumpet All Time Top 10. 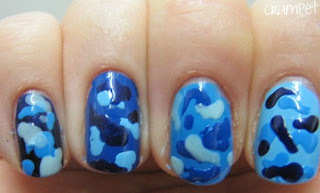 And then this afternoon, as I was continuing my Barry M odyssey, this just sort of evolved, and when I finished it, I KNEW it was what I wanted my 200th post to be – something a little more wow than I usually do, but something that I have managed to pull off! Lol. 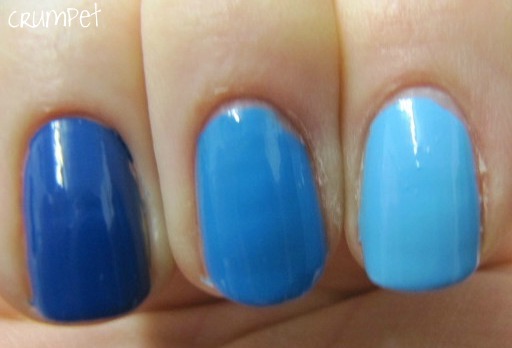 I love how they look together as a skittle, but then, I love skittle manis full stop. 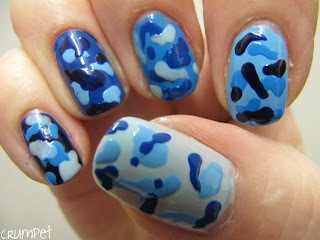 But something strange is also happening – I am no longer aesthetically allergic to blue nail polish. Yikes! I don’t know how it happened, but I’m quite liking the blue against my vampire-white skin. Blue is just purple on a cold day, right? 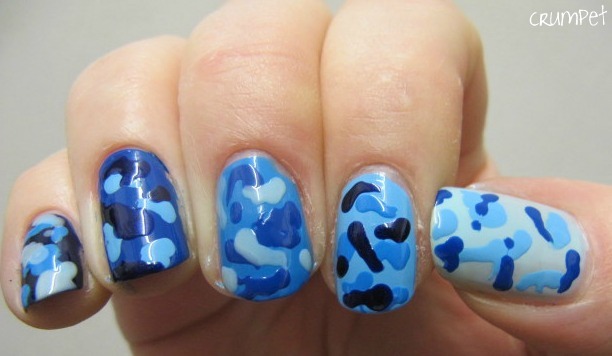 Quite by accident, this then turned into a camouflage mani. 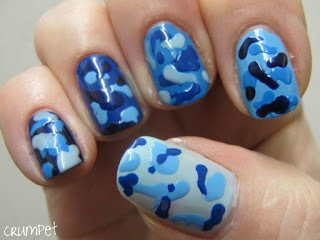 I didn’t know what I was going to do and then I remembered how much I loved my purple camo mani and how wonderful blue camo looks, and as I looked at my skittles, the idea formed – a blue skittle camo mani! And that’s what we have and I am super super happy with myself. 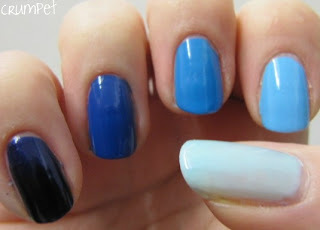 Each nail features 2 other blues, and I honestly can’t decide which nail I like best. Possibly the ring finger. Or the index. No, the ring. 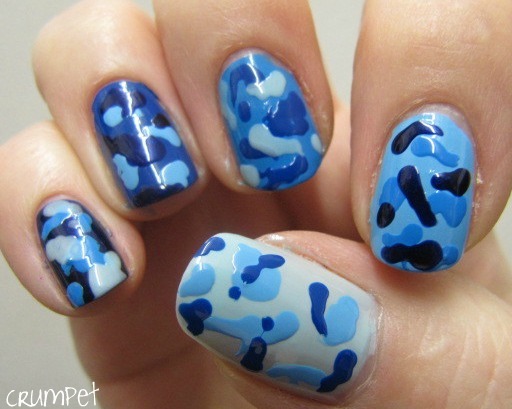 Camouflage nails are really easy to do. I use a medium dotting tool and basically dab. You can’t go “wrong” because you are creating a random pattern, and not just that, but a pattern that very often overlayers itself.